The extended abstracts should be sent by e-mail to the conference office until 30 April 2019. Please send abstracts as PDF-files or MS-Word documents written in English by e-mail to the following e-mail address: info@3dbody.tech. It is expected that one of the authors presents the paper personally at the conference. Reduced registration fees are available for speakers/presenters: registration. Please plan to attend the whole conference as changes in the program (e.g. switching of technical sessions) are possible until few days before the conference. The submitted extended abstracts will be reviewed and evaluated for acceptance. Authors of accepted abstracts should submit full papers following the given guidelines. The submitted papers will be published as conference proceedings with ISBN number, available in digital form (on USB flash drive and/or FTP download). DOI (digital object identification) numbers will be assigned to the single published papers. The abstracts and the papers will be available on-line at the website www.3dbody.tech/cap. The works presented at the conference will be differentiated into three groups: accepted papers (upon review of the submitted extended abstracts), invited speaker presentations (with or without papers), technical presentations (mainly from exhibitors, eventually without papers). All the submitted papers have to be presented personally by one of the authors. Reduced registration fees are available for speakers/presenters: registration. Please plan to attend the whole conference as changes in the program are possible until few days before the conference. Authors of excellent 3DBODY.TECH 2019 conference papers will be given the opportunity to submit extended versions of their articles to academic journals and to be published on post-conference volumes and/or special issues/collections. These papers will have to pass peer-review processes before publication. This opportunity is available for the sectors/jounrals listed below. Note: we are currectly seeking collaborations with additional journals in different sectors (antrhopometry, ergonomics, medicine, health, fitness/sport). 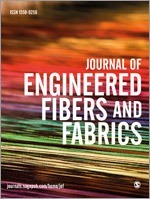 Journal of Engineered Fibers and Fabrics (JEFF) is a peer-reviewed, pure open access journal which aims to facilitate the rapid and wide dissemination of research in the engineering of textiles, clothing and fiber based structures. Authors of selected 3DBODY.TECH 2019 conference papers will be given the opportunity to submit extended articles to a Special Collection on "3D Body Scanning in the Apparel Industry". More detailed information will be availble soon. Please submit the full paper as MS-Word document, before 31 August 2019, by e-mail to the following e-mail address: info@3dbody.tech. Here below you can find an example how to cite the papers published in the proceedings of the conference (based on the IEEE citation style and with DOI). Note: please always add/indicate the DOI number (assigned to all published papers) as full link. L. Walfram et al., "Complex Body Segments Volume Calculation Using a 3D Full Body Scanning System", in Proc. of 3DBODY.TECH 2019 - 10th Int. Conf. and Exh. on 3D Body Scanning and Processing Technologies, Lugano, Switzerland, 22-23 Oct. 2019, pp. 112-120, https://doi.org/10.15221/18.091. It is required that at least one of the authors presents the paper personally at the conference. Please plan to attend the whole 2-days conference as changes in the program are possible until few days before the conference. Oral presentation should be 18 minutes long. This will allow additional 4 minutes for questions and discussion. Additional time may be available depending on the session. Please ensure you arrive before the start of the session in which you are presenting and introduce yourself to the chair of the session. Note: chairmen will be listed in the final program. No specific template is defined for the presentations. Presenters can freely design and setup it according to his/her style. Windows Laptops with MS Powerpoint will be available in the conference rooms. Please bring backups of your presentation on USB flash drive. We suggest however the authors to bring and use their own laptop to avoid compatibility problems (e.g. different versions of Powerpoint, linked files, videos, etc.). LCD projectors in the conference rooms have HDMI connection and 16:9 display mode. Please note that electricity in Switzerland operates on 220-240 Volts AC 50HZ and that Swiss 3-poles electric plugs are different from European-style plugs. Please bring with you the necessary adapters. Important note for Apple/MAC Laptops and/or Tablets: please bring the necessary adapters in order to connect your device with projectors featuring HDMI plug. Posters will be mounted on free-standing poster boards with push pins. All posters will have a net usable space of 90cm (36") wide x 120cm (48") hight. No specific template is defined for the posters. Presenters can freely design and setup it according to his/her style. Authors should mount their posters on the assigned poster board, in the designated room. Posters may be mounted starting from 8:00 am on the assigned poster session day. At least one named author is required to be present at his poster during the poster session. All presenters should remove their posters at the end of the poster session.